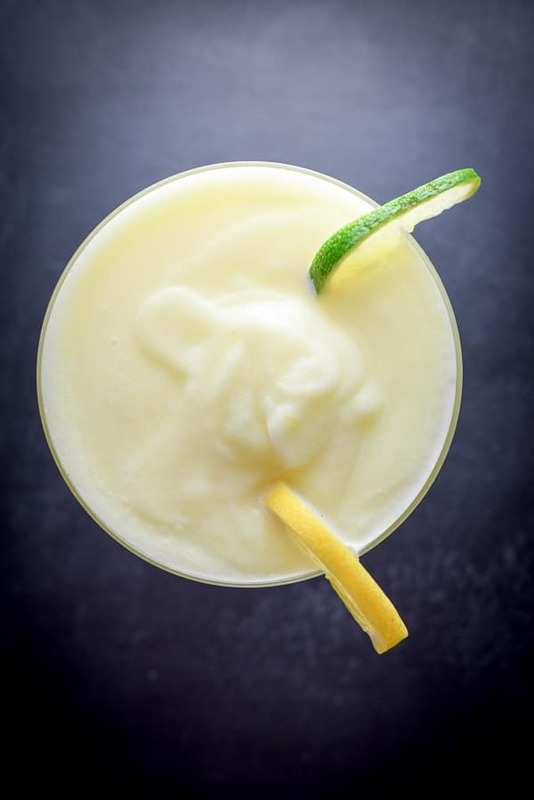 The best thing about this lemon curd margarita recipe is the flavor! It is not overly lemony but perfectly balanced and smoothly refreshing! Lemon Curd, Nectar of the Gods! I made lemon curd recently and immediately had to plan what other recipes I was going to make using the glorious yellow stuff! In addition to this cocktail, I made some lemon curd bars. Do I need to use Premium Ingredients for this Lemon Curd margarita? 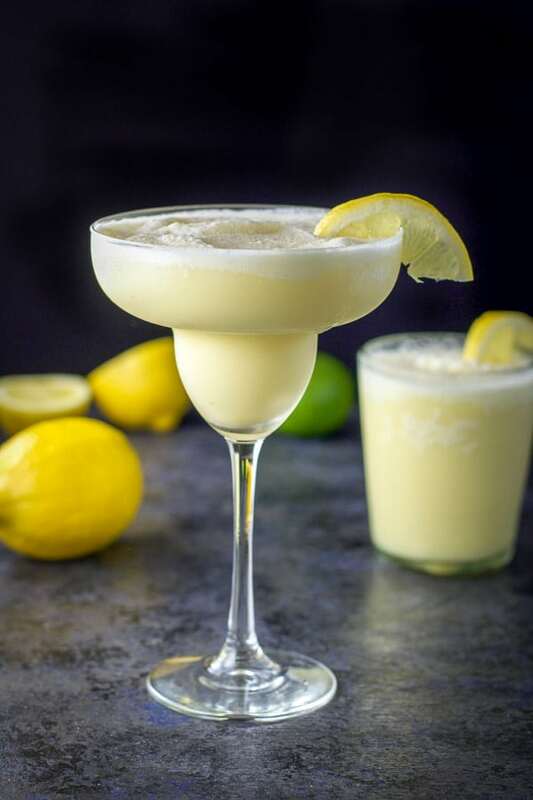 Do you need to sweeten this Lemon Curd Margarita? Can I make this cocktail with a Ninja blender? 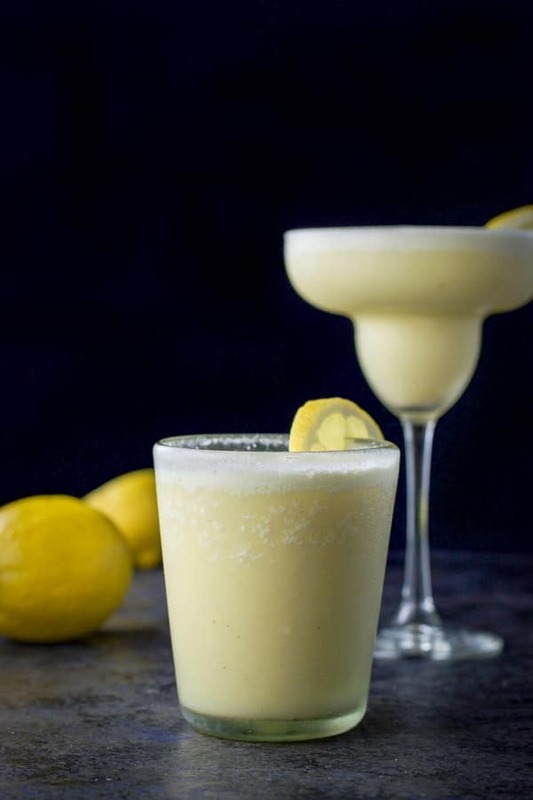 I would usually say yes and if money is no object, premium brands taste best, but when you make a flavored cocktail like this lemon curd margarita, it’s okay to be less particular with the ingredients because the fruit, lemon curd or other heavy flavors mask the premium taste. No. Lemon curd is already sweet, so adding simple syrup would make the cocktail too sweet, in my opinion. Follow the recipe as written your first time and taste the result. Then if you think it needs more sweetener, add simple syrup. Get your blender out. Once you measure out the ingredients, pour into the blender. 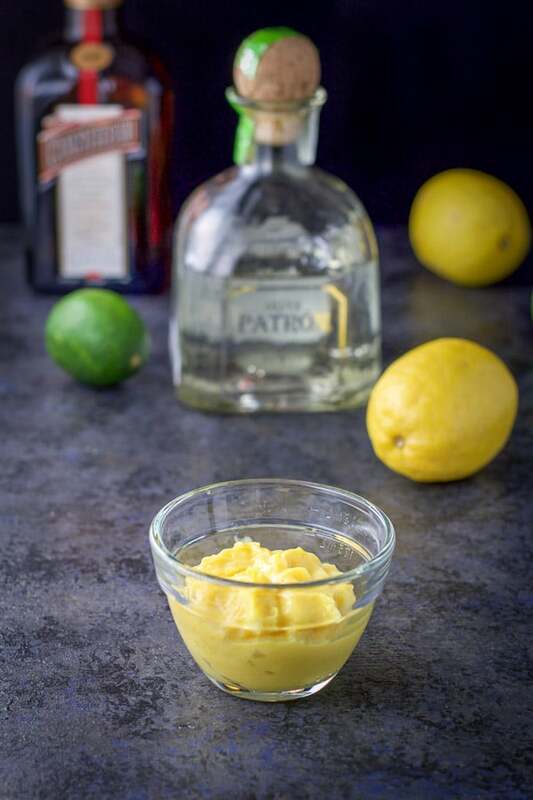 Gather the ingredients – lemon curd, tequila, Cointreau, lemon and lime. Add 1 1/2 cups to 2 cups of ice and turn the blender on high. Once the contents are smooth, pour them into the margarita glasses and place lemon slices on the side of each glass as garnish. Yes. I use a ninja blender. Unlike the traditional blender, Ninja blender blades are on the lid. Sometimes the blades need help reaching the lemon curd, so I take a long spoon and stir everything together, making sure the lemon curd has incorporated. If you use a regular blender, the ingredients will go in the bottom where the blades are, so you won’t have to stir it. These lemon curd margaritas look so good. Let’s look at them from a different vantage point. What about the aerial view? Don’t mind if I do. I could dive right into it! Couldn’t you? 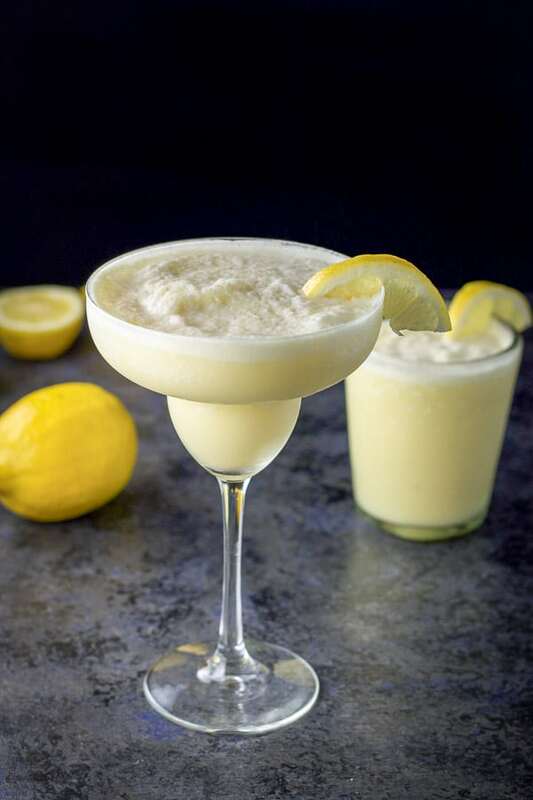 I hope you enjoyed this lemon curd margarita recipe as much we do. Please feel free to leave me a comment. Do you use premium alcohol? Do you notice a difference? I’d love to know. 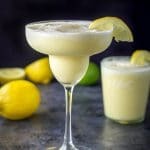 If you’ve tried this lemon curd margarita or any other recipe on the blog, I’d love the hear what you thought about it in the comments below. I love hearing from you! You can also FOLLOW ME on FACEBOOK, TWITTER, INSTAGRAM and PINTEREST to see more of my delicious food and delightful cocktails! This refreshing lemon curd margarita is a keeper! This post was first published April of 2017. Silvia, hehe. Indeed, it’s 5:00 somewhere! What a BRILLIANT way to use lemon curd! This margarita looks so creamy, I bet it tastes just as good as it looks! It’s almost like a frozen lemonade. Yummy and easy to go down Andrea! Genuinely love this idea. Can’t actually even talk coherently, as I’m swooning at the thought of drinking lemon curd! Oh wow! This cocktail looks incredible. I never thought to combine lemon curd with margaritas- I bet the texture is fantastic. I love your styling. Thanks you Tara! It’s super duper yummy! I’m such a lemon lover that I always have extra lemon curd on hand. I can’t wait to give these a try with the girls! I know what I want for Cinco de Mayo this year! Charlotte, Mmmm. Cinco de Mayo!! Perfect. I can imagine the mix of sweet and sour would be scrumptious! It’s such a satisfying cocktail Christopher! This summer I have been all about lemon-flavored EVERYTHING! What a brilliant idea to use the curd in a drink! I have to try this! Lol Chris! Yup. Most dangerous indeed. Wow, lemon and lime! I bet this is an amazing cocktail. Thank you! A lemon curd margarita?? How fabulous is that!! This looks fantastic. I never would have thought to use lemon curn in a cocktail. I LOVE all the curds I’ve ever tasted (lemon, lime, grapefruit), I bet other variations of this would be delicious too! Thanks Catherine! I’m all for curd, in baked goods or drinks. Yum! This drink is so tempting. I never tried lemon curd with alcohol before. I am sure this is super delicious. Need to try soon. Thank you Deepika!! I appreciate it! Thank you so much Natalie! I appreciate it!